The English Ocarina is an amazing instrument! With an Ocarina, you can glissando up and down like a trombonist, tongue rapid passages like an orchestral wind player and ‘bend’ notes like a blues guitarist. Ocarina music makes the most of the Ocarina’s particular capabilities to give you a rich and rewarding experience. Reading music is not essential – experimenting is! Once you’ve discovered how to make a good sound and play lots of notes, then the whole world of music opens up. 1-2-3 Ocarina and Play your Ocarina Books help you to do this. The 31 original songs in ‘1-2-3 Ocarina’ introduce one note at a time and teach you to read music as you play. The character of each song changes from happy to sad to mysterious with the simplest of finger movements. By the end of the book, you’ll be able to play 10 notes and all 31 songs in many keys, along with the audio CD. Ocarina-shaped charts – Oc-Pix™ and Oc-Box™ – help ‘first-timers’ play the right notes in the right order. ‘Play your Ocarina’ Books all feature these special charts under the music. This means that a large number of notes can be introduced straight away to encourage the fluent playing of a broad repertoire. Children have been known to play all 140 arrangements in the six ‘Play your Ocarina’ Books by the age of nine or ten, and perform them in public. The six hours of music in the series includes familiar folk, seasonal, popular and classical tunes suitable for any age of child (5 years up) or adult. All the music is transcribed for the Ocarina at singing pitch, for solo and group performance. Amazingly, most Ocarina music is played on just four finger-holes. The 4-hole Oc is therefore perfect for younger players and those who are happy to ‘just have fun’ exploring the easiest 100 or so tunes in the books. The thumb-holes of the 6-hole Oc remain covered until needed, for example with some harder tunes in Book 4. The 6-hole Oc is for playing the full works to become a complete musician. 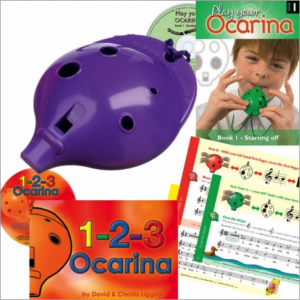 Explore the Ocarina and Book Sets to find the best set for you.